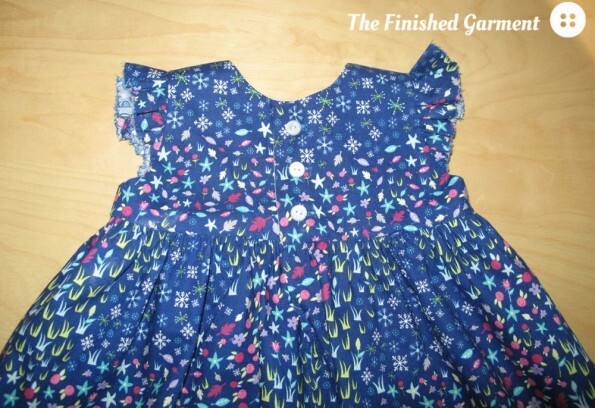 There is one little person who has been missing out of the handmade sewing this year, and that is my smallest. As kid number four, she has a huge selection of hand-me-downs, but it’s still nice to have something new once in a while. 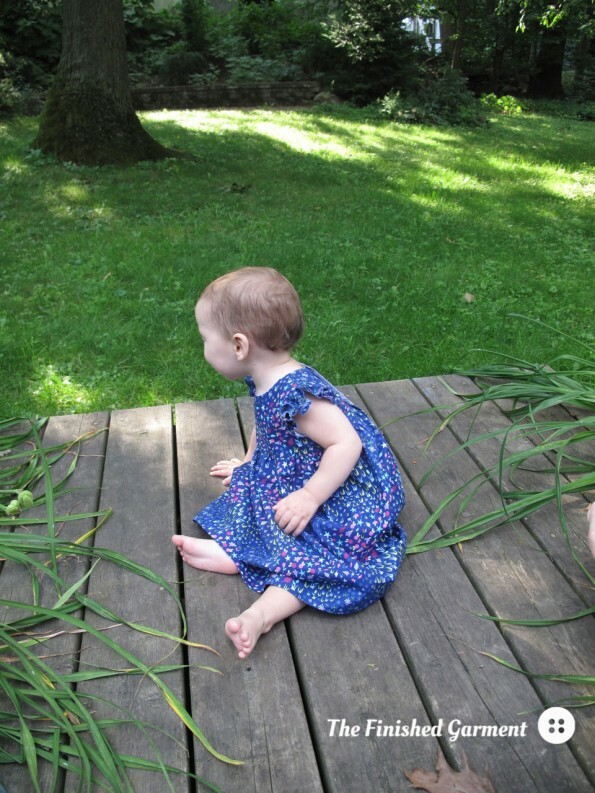 As soon as I saw this fabric I knew it would be perfect for a summer dress and I knew just the right pattern – the Geranium Dress from Made by Rae. This is the 12-18 month size and the length is great. I bought this pattern way back in January, so it was about time to actually make it. This is a great pattern. 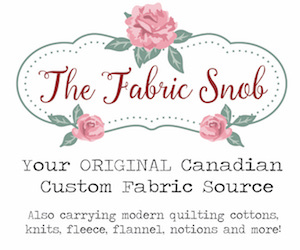 It’s cute, quick, easy to sew and comes with some nice variations for sleeves, neckline and pockets. You can also make it as a top. And it’s easy to add a personal touch with piping, rickrack and other trim. I chose the simple curved neckline and flutter sleeves. The pattern calls for the sleeves to be finished with a zigzag stitch, which sounded a bit odd to me. I saw some versions of the flutter sleeves online which were lined, but they looked really stiff. So I stuck with the directions and I’m happy with the results. The fabric is Floral Meadow from the Storybook Lane collection by Kelly Lee-Creel for Andover Fabrics (courtesy Warp & Weft Exquisite Textiles). The lining is white cotton batiste. The sizing was really good. I made the 12-18 months size and it fits well, but will also probably last through to spring. I have a new walker, sometimes crawler here, so she sometimes finds the length a bit annoying, but I think it looks adorable. I love the colour. Nice and bright. For fabric I used Floral Meadow from the Storybook Lane collection by Kelly Lee-Creel for Andover Fabrics (courtesy Warp & Weft Exquisite Textiles). So beautiful! It also has a great hand. 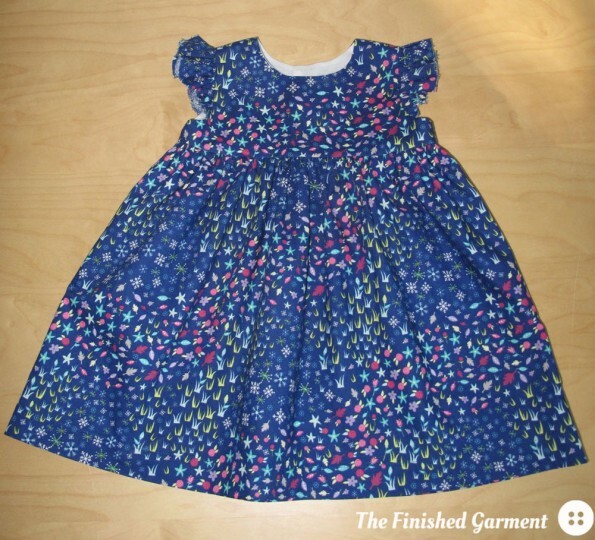 I don’t think I’ve ever used fabric from Andover and I was quite impressed. I used simple white buttons. You can see how the fabric has a slight sheen. 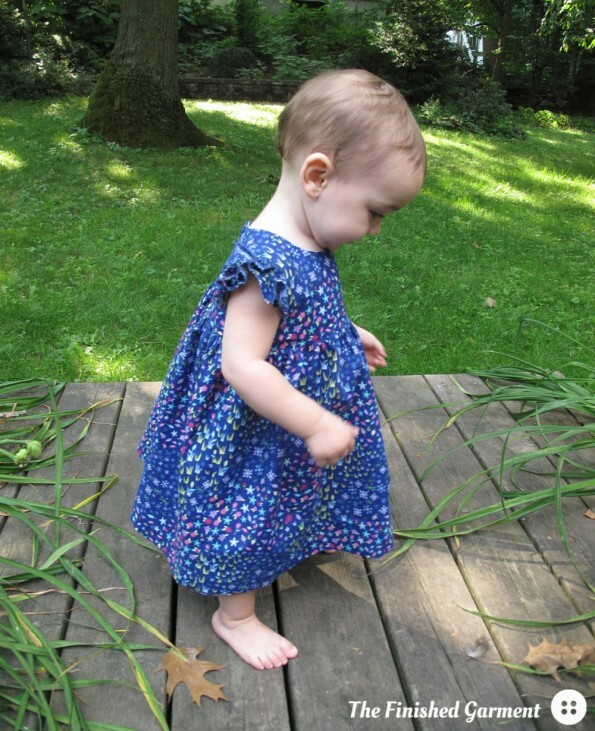 The pattern calls for 1 1/3 yards of fabric for the 12-18 months size. Even though the print I used is directional, I still had a lot left over. I was even going to make a matching diaper cover, but my printer ran out of cyan ink – because you need that to print in black and white. I hate it when that happens. This is possibly my favourite sewing project. I love the results. Super cute! 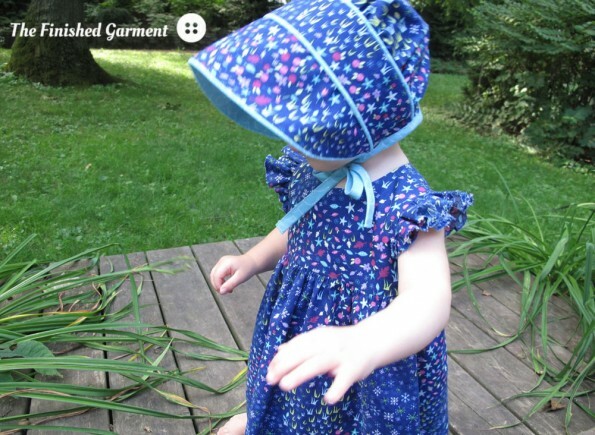 Only one thing could make it cuter… a bonnet! It’s hard to up the cute factor with this dress, but a bonnet will do it every time. 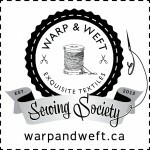 This is a Warp & Weft Sewing Society project. We are a group of talented sewists and quilters creating beautiful projects inspired by the fabrics from Warp & Weft Exquisite Textiles. You can find the fabric used in this project, Floral Meadow from the Storybook Lane collection, online in the Warp & Weft shop. Fabric: Floral Meadow from the Storybook Lane collection by Kelly Lee-Creel for Andover Fabrics. Courtesy Warp & Weft Exquisite Textiles. 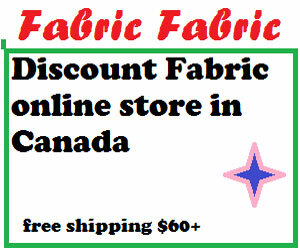 The lining is white cotton batiste. Results: Great. I would recommend this pattern and would make it again. Not quite steady on her feet. Such a sweet little dress – your baby looks like a little doll with her new outfit! Love the sleeve detail – good choice! 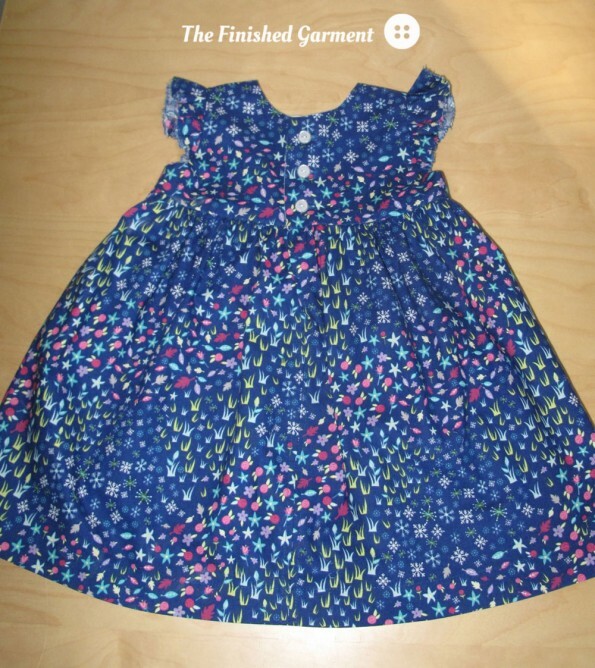 Very cute dress, I love that fabric too! 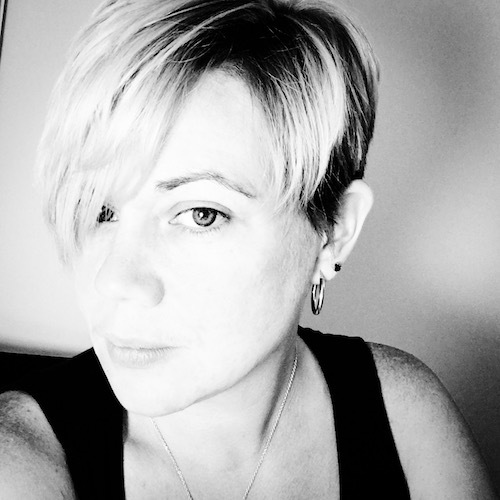 Caroline Côté recently posted…Underpants, so Stretchy and Elastic, it’s Fantastic! Oh my gosh! *Cutest* ever!! Sooo sweet! love it! I love this! 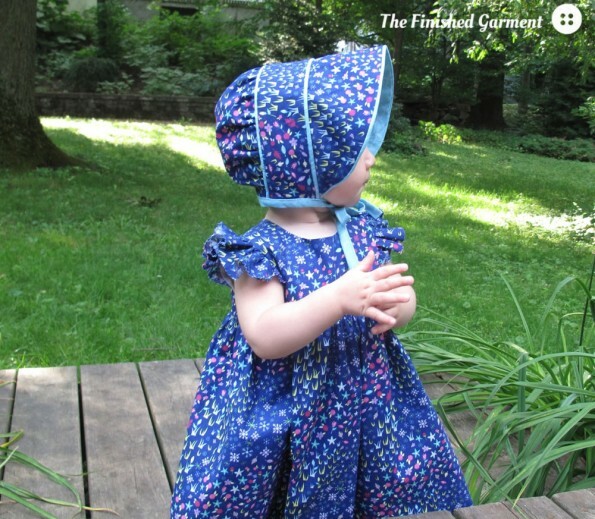 The matching bonnet is just adorable! Previous Previous post: Meetup Loot!